In Calendar, select New Appointment. Add a Subject, Location, and the start and end times. Select Invite Attendees to turn the appointment into a meeting. Select Save & Close to finish, or Send if it's a meeting. 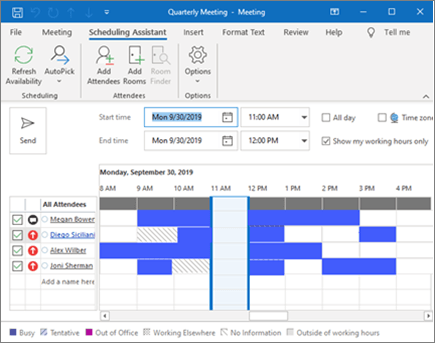 When you create a meeting, use the Scheduling Assistant to see when attendees and rooms are available. From a new meeting request, select Scheduling Assistant. The shaded area with vertical bars shows the meeting time. Drag the bars to adjust the meeting time. The grid shows when attendees are available. 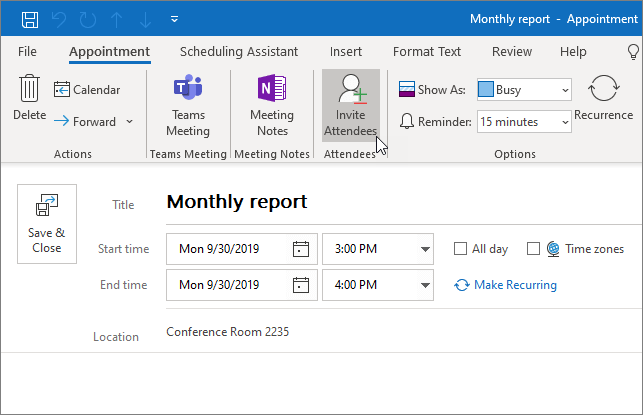 To the right of the meeting request, Outlook shows suggested times and the number of conflicts. Select New Contact or press Ctrl+N. 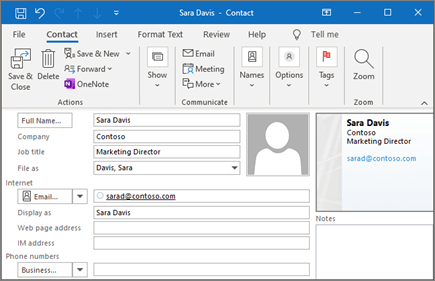 Select Save & New to create another contact, or Save & Close if you're done.